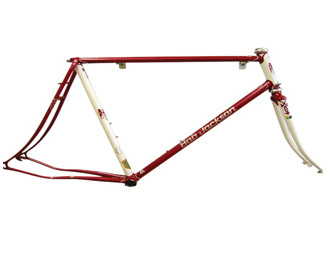 This frameset is a true work of art. All the old skills and craftsmanship are here to produce a frameset with handcut lug work and curly seat and chainstays. Built from reynolds 631 tubing with 531 seat & chainstays. Fancy hand cut lug work and b/j top eyes on the seat stays. Cast horizontal dropouts are fittted with single eyes to front and double eyes rear( rear dropout spacing 130mm) this frameset is built to fit 47-57mm brakes which allows a 700x28c tyres with mudguards to be fitted.